Having to tell any patient that their images show the need for surgery is never easy, but when the patient is a high school baseball player, delivering this sort of news is all the more difficult. I recently had a 17-year-old male in for extreme shoulder pain. His orthopedic surgeon sent him to Charter Radiology with an order for a shoulder MRI to diagnose the cause of the pain and extent of possible injury from baseball. Most orthopedists send these types of injuries, often seen in young athletes, to Charter for MRI because of the extent of our experience and our state-of-the-art imaging equipment. 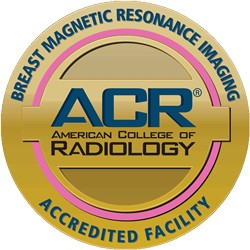 In fact, shoulder MR arthrogram is my area of expertise and an imaging study I am very well known for because I have specialized in this area for more than 16 years. You can say this is an imaging study I can do in my sleep because of the sheer number of them I have performed. But what I have also learned over the years is that every athlete or individual who comes to Charter for the study is unique. Every patient comes with their own story and I take every case very seriously, and personally. So, when I saw this young man, an all-around athlete who was so very personable, I could see the pain he was in physically, and emotionally. Many orthopedic surgeons order an MRI at Charter because we have the most advanced 3 Tesla imaging technology that produces highly superior images. 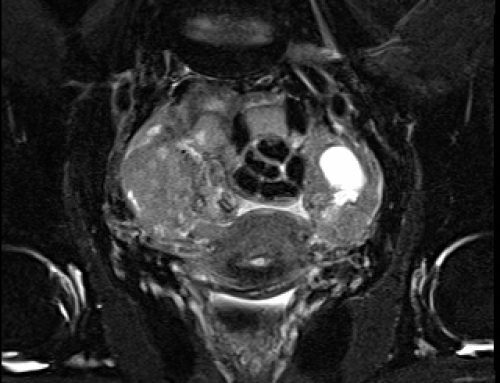 In most cases, because of the spectacular images produced by 3 Tesla MRI, an MR arthrogram is not also necessary to see the extent of injury. 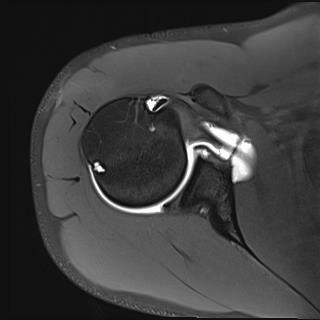 However, in this case, while the MRI images showed a tear of the labrum, they were not as clear as an MR arthrogram would be and I suspected the injury was to a much larger extent. 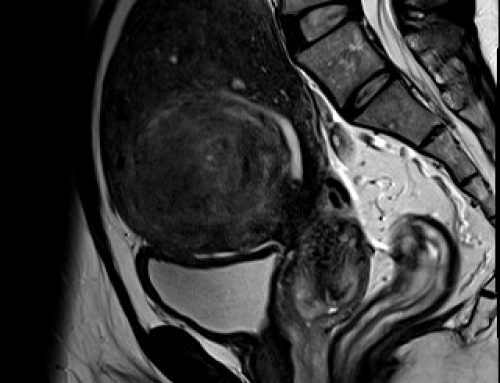 Therefore, I recommended an MR arthrogram to confirm the diagnosis. 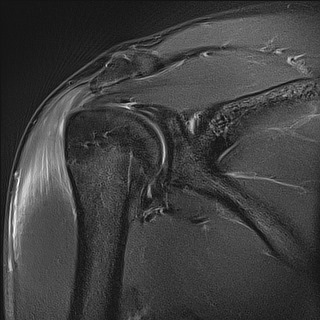 Amazingly, even though 3 Tesla MRI is the highest powered imaging modality for MRI, the images of the labrum tear in the shoulder from the MR arthrogram were significantly better at visualizing the damage. 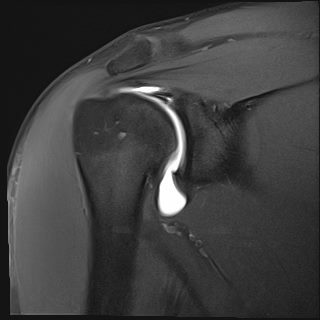 For shoulder injuries, especially in young patients and younger athletes, MR arthrogram is the imaging study of choice. 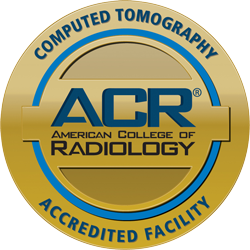 The difference in quality between the patient’s first MRI and the arthrogram was very significant. With an arthrogram, a saline solution is injected into the affected shoulder joint to distend the joint, allowing the labrum to stand out. By distending the joint, we are able to better visualize any tears in the labrum. The labrum is a piece of fibrocartilage or rubbery tissue that keeps the ball of the shoulder joint in place. When it is torn through injury, patients may experience a clicking in the shoulder as well as severe pain. This type of tear is common in younger athletes, especially baseball players, due to the constant cocking back of the shoulder for throwing. As I was performing the arthrogram study on the young man, I was monitoring the images as they came up on the computer screen. I was amazed to see the extent of the tear in both the superior and inferior labrum. The tear was from 2:00 to 7:00 (which is how we measure the injury), which was very significant. I always make a point to talk to my patients directly. As the young man came out of the arthrogram he asked me what was wrong. I told him about the large tear and his face just fell; he knew that such an injury meant surgery and many weeks of missed baseball. I tried to cheer him up by explaining, “I see so many patients with this injury. With surgery and rehab, you’ll be back to playing baseball before you know it.” I then went out to talk to his mother. The patient’s mother then called me the next day to let me know that her son really appreciated that I talked to him directly and was reassuring. 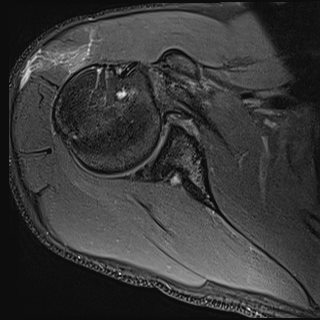 Images 1 and 2 are routine MRI performed on a 3 Tesla Skyra Siemens MRI, and Images 3 and 4 are MR arthrogram performed on the same 3 Tesla Siemens Skyra MRI to demonstrate superior and anterior labral tear confirmed surgically.